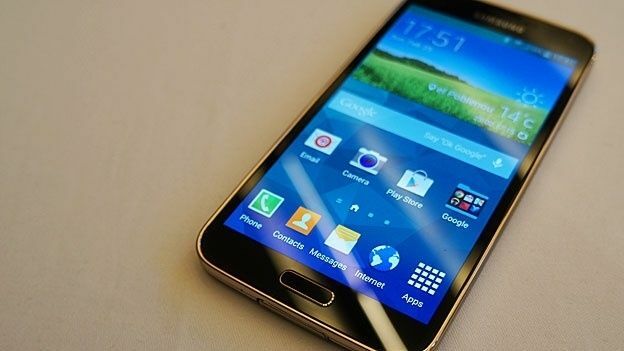 Samsung is reportedly scrapping its own fingerprint scanner in favour of the touch-based tech used on Apple's iPhones. Back in 2014, Samsung introduced a fingerprint scanner on the Galaxy S5 in order to beef up security and protect people's data. However according to SamMobile, Samsung will install a different sensor on the upcoming Galaxy S6. The site's “highly credible sources” say that Samsung is ditching its swipe-based scanner, which failed to read fingers easily as the home button wasn't big enough, for a touch-based sensor akin to the TouchID tool that's used on the iPhone 5s, iPhone 6 and iPhone 6 Plus. The sources say that Samsung has made the home button on the Galaxy S6 significantly larger than the one on the Galaxy S5 and Galaxy Note 4, so users can enjoy a greater rate of success. With the new tech users simply place their fingertip on the home key – at any angle – then lift it off and hurrah, the phone will be unlocked. As well as the new sensor, the Galaxy S6 is expected to pack plenty of high-end specs. Features reportedly en route include the new Qualcomm Snapdragon 810 processor, 3GB of RAM and a 21-megapixel rear camera. Not long ago we heard that Samsung was weighing up two Galaxy S6 designs. Meanwhile an app tutorial video recently featured a mystery handset thought to be the upcoming flagship. The Samsung Galaxy S6 is expected to debut at Mobile World Congress in March alongside the HTC One M9, Sony Xperia Z4 and LG G4.